A Russian Progress supply ship blasted off on top of a Soyuz rocket Wednesday and completed an expedited pursuit of the International Space Station with a smooth automated docking less than six hours later, delivering 5,700 pounds of food, fuel and supplies. Launch from the Baikonur Cosmodrome in Kazakhstan occurred at 5:44:44 p.m. EDT (2144:44 GMT) Wednesday, or 3:44 a.m. local time at the Central Asia spaceport. 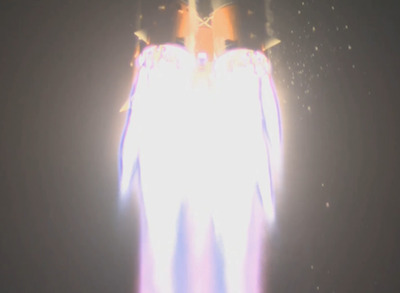 The Progress M-24M spaceship's Soyuz rocket fired its kerosene-fueled engines and ramped up to full thrust before four hold-down clamps opened to release the powerful launcher, which climbed into a starry sky and turned northeast from Baikonur to begin its high-speed pursuit of the 450-ton research complex. The space station was flying 260 miles over northeast Kazakhstan at the time of launch, shortening the trip for the Progress resupply ship. The three-stage Soyuz booster delivered the Progress spacecraft to orbit less than 10 minutes after liftoff, and the Progress completed a programmed set of commands to extend antennas and its power-generating solar arrays, according to a NASA spokesperson. The spacecraft's payload of 2.8 tons includes 1,764 pounds of propellant, 926 pounds of water, 57 pounds of air and 48 pounds of oxygen, plus 2,910 pounds of supplies, spare parts and experiment hardware packed inside its pressurized logistics module. The Progress M-24M spacecraft began an automated rendezvous sequence a few hours later, firing its thrusters to adjust its course to the space station. A Kurs rendezvous radar aboard the Progress autonomously guided the spaceship toward the Pirs module on the Earth-facing side of the space station's Zvezda service module. Docking occurred at 11:31 p.m. EDT (0331 GMT), marking the 150th successful mission in support of the space station's assembly, maintenance and utilization dating back to 1998. The previous Progress cargo craft departed the Pirs docking compartment Monday, carrying trash and other excess equipment away from the space station for a destructive re-entry over the Pacific Ocean set for July 31. The mission also marked the 56th Progress logistics flight to the space station since 2000, giving it the name Progress 56P in the program's matrix of assembly and utilization missions. The space station's six-person crew is led by NASA astronaut Steve Swanson, who is joined aboard the outpost by NASA flight engineer Reid Wiseman, European Space Agency astronaut Alexander Gerst and Russian cosmonauts Maxim Suraev, Alexander Skvortsov and Oleg Artemyev. The Progress M-24M spacecraft will remain attached to the space station until Oct. 27. Russian ground crews rolled the Soyuz rocket and Progress spacecraft to the launch pad Tuesday, then erected the launcher vertical before access towers enclosed the booster. Another space station resupply vehicle is being readied for launch July 29 from the Guiana Space Center on the northern coast of South America. The European Space Agency's fifth and final Automated Transfer Vehicle will reach the station Aug. 12.